As the seasons begin to change, the air gets crisp and the leaves begin falling off the trees in your favorite place — the backyard. This is such a fun time of year to spend time with your family, enjoying the crisp air while it lasts. One way to enjoy some fun this season is by playing sports on your Sport Court game court. You and your family can still utilize your Sport Court flooring until the weather gets wet and icy — as long as you can handle the cool air, that is. Between basketball, tennis, soccer and even touch football, you won’t want to say goodbye to your Sport Court game court until spring comes around again. As colder weather hits, be sure you are maintaining the game court to keep it in good condition so that it lasts your family for years to come. Do you have trees near your game court Sport Court home basketball court? During the fall, be sure to rake the leaves off frequently to keep your space clear. As you’re enjoying this court through the end of the season, these leaves present a danger to all players. In addition to that, if you leave them on the ground throughout the winter, it may cause the court to get stained from moss or mildew. If your Sport Court flooring has stains on it, grab cold water detergent solution and a soft brush to remove the stain — a chore you don’t want to create for yourself before spring even starts. If you have an outdoor Sport Court game court and live in a colder climate, you will want to remove the nets for the winter months. The snow and ice can cause damage to the nets, deeming them useless when the sun welcomes you back outside. Take them down and store them in a dry spot until warmer weather is back. When is the best time to repair your Sport Court home basketball court? Before winter comes, if you’ve noticed that you’ve got cracks or holes in your flooring, it’s time to get your repairs taken care of. During the winter months, snow and ice can seep into the holes and cracks, causing them to expand and create lasting damage. 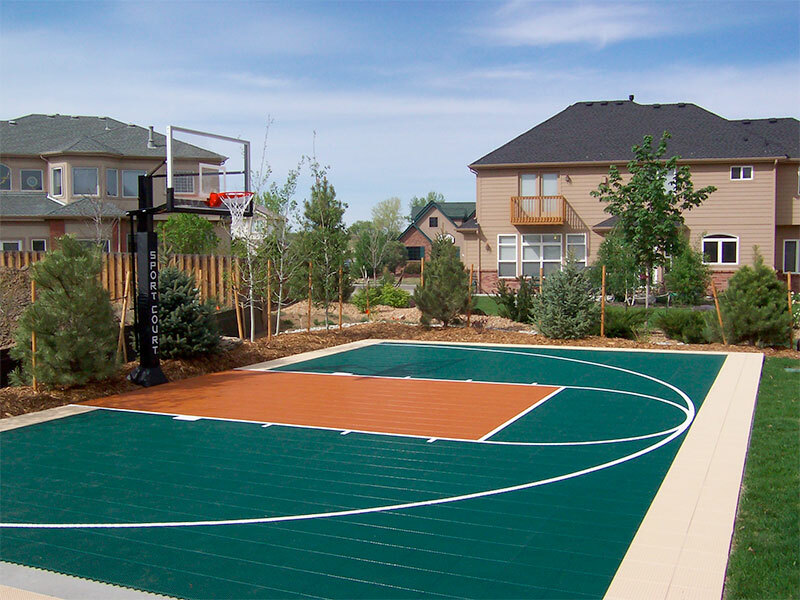 Sport court game courts are a fun addition to your home. Keep it in good condition by preparing it for the cold winter months, and you’ll have the pleasure of a Sport Court home basketball court for years to come.